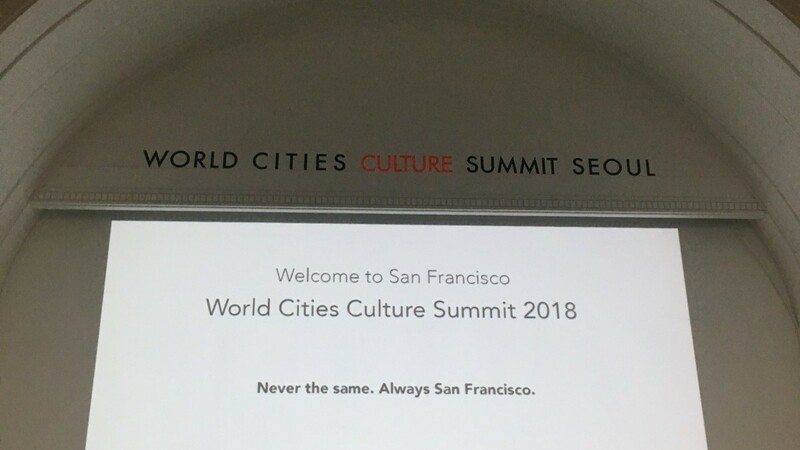 The next World Cities Culture Summit will take place in San Francisco in 2018, it has been announced on the final day of this year’s international conference. The news follows a highly successful meeting of city leaders and top cultural experts from 28 cities who, over the last three days in Seoul, have been debating the significant role that culture has to play in the social and economic success of major cities around the world. San Francisco has been chosen to host next year’s summit thanks to its position at the centre of the creative digital economy and its unprecedented growth both in terms of economy and population. Culture and art is at the core of the identity of San Francisco as a city, and an integral part of its urban policy. The summit is organised by the World Cities Culture Forum, which is made up of 35 world cities, who all recognise the impact and importance of culture and creativity and are committed to them being at the heart of public policy and city planning. This year’s summit, in Seoul, saw debate around a range of themes, particularly focusing on the impact technological, social and political changes are having on culture and the way people interact with each other. The summit also saw the launch of the new Leadership Exchange Programme, the first-ever exchange designed for cities to learn from one another and share ideas to solve common challenges across the globe. As Mayors around the world invest in cultural projects ranging from cultural facilities and arts programming, to affordable workspace, tourism and sustainability, the WCCF Leadership Exchange Programme is an opportunity to bring cities together. Through peer-to-peer learning they will share the best of these ideas and approaches from around the world. The World Cities Culture Forum has been a hotbed of collaboration over the past six years. This has included London’s Creative Land Trust, which was inspired by San Francisco’s Community Arts Stabilization Trust, Toronto’s discussion with Sydney about waterfront development as the city transforms the area around Lake Ontario, and Edinburgh’s work with Montreal to create its own strategy to map creative workspaces. “Culture is a golden thread that runs through our cities, defining their character and acting as the catalyst for ideas and innovation. But as cities grow there are serious challenges, and the World Cities Culture Forum is working on practical solutions to ensure talent and creativity can flourish. Over the past three days in Seoul, cultural leaders from across the world have shared ideas about how culture can improve everyday life and how citizen engagement and participation is critical to the success of each our cities. Thanks to Bloomberg Philanthropies and Google Arts and Culture we have also launched the World Cities Leadership Exchange, providing a new opportunity for member cities to learn about each other’s great projects and adapt them in a way that will improve their own cities.